From August 15, 1971, to November 15, 2018, if every business day you bought the London PM Fix and sold the AM fix the next day, the collective profits you would have skimmed from that constant trade would have been $3,208.17. That is represented above by the blue line. 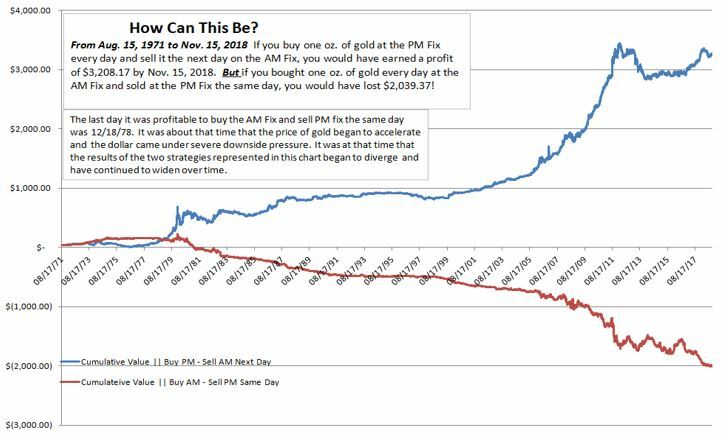 If, on the other hand, you had purchased gold on the London AM Fix every day and sold it at the PM Fix every day and kept doing that every day, you would have suffered a collective loss of $2,039.37. How can that disparity be but for some kind of futures paper market manipulation? If you have an answer, I would like to know. Dimitri Spec, who initially crunched the numbers that revealed the time/price discrepancy in the paper markets for gold, sent me an email earlier this week to advise me that “The ‘classical’ Fixing Manipulation has disappeared.” The one chart below shows the intraday average 1993-2013. The other the current chart below right shows manipulation patterns since then that are now occurring later in the day. Indeed, looking at my chart above, you can see a decline in the profitability of the PM/AM next-day trade more or less coinciding with the change of manipulation pattern that Dimitri is talking about. Why the change in this pattern? Obviously, the manipulation hasn’t gone away but Dimitri thinks it may have s something to do with the fact that a lot of criticism leading up to the change. The question is why there should be a time discrepancy if this is a true global market. Why shouldn’t there be pretty much a straight line over a 24-hour period of so many data points?